The United States has experienced mass incarceration, and now 2 million people are held in federal prisons and correctional institutions across the country. 80,000 of those, or 4.8%, are diabetics1. Statistics from 1998 show that 11 million people were set free from correctional institutions. Many more pass through the system, such as diabetics experiencing hypoglycemic episodes on the roadways who are often mistaken for being intoxicated or on illegal drugs2. The American Diabetes Association has written policies to guide correctional institutions in meeting national standards for diabetes care. They include provisions where a diabetic who is incarcerated would be allowed to perform their own self-care, including finger stick blood sugars and insulin or other diabetes injections, as well as keep extra carbohydrates in their jail cell for the possibility of a low blood sugar. The ADA stand generally sets forth standards where all prisons should continue Medical Nutrition Therapy, a regular activity regimen, and special dietary considerations for those with diabetes. It is true that a prison is a controlled environment. If everything were to be in place in prison for the diabetic as ADA envisions, then diabetes management in the prison would likely be better than diabetes management for the person prior to incarceration. This has been shown to be true in some prisons who do have strict guidelines for providing care to their diabetic prisoners and are following them. 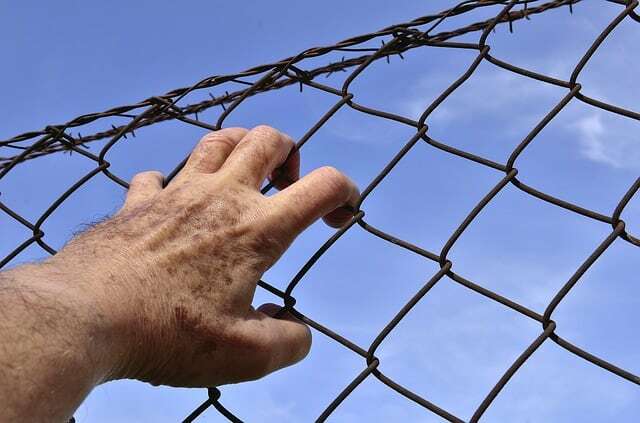 Some diabetics A1C prior to incarceration has been shown to drop several points once incarcerated due to stricter monitoring in the institution. The ADA recognizes a need for screening upon entrance to a correctional facility. A person with diabetes who is being incarcerated, particularly one who takes insulin injections, should be recognized immediately. This is to make sure that all those of particularly high risk for high or low blood sugars, and subsequent DKA or insulin shock are brought to the attention of facility guards and medical personnel. All of these patients should have their blood sugars checked within 1-2 hours of arrival at a correctional institution. Anyone brought to a facility displaying symptoms of confusion, sweating, irritability, or uncooperativeness that is thought to be under the influence of alcohol or drugs should also have their blood sugars checked to make sure that they are not experiencing hypoglycemia. An inmate’s prescriptions or Medical Nutrition Therapy should not be stopped. They should continue without pause. All diabetics, Type 1 and Type 2, should have a physical examination by a licensed medical professional “within a timely manner,” according to the ADA guidelines. For females, if a woman inmate is pregnant, the same guidelines for Gestational Diabetes apply as are in the Standards for Medical Care. They are to receive an initial screening and another at 24 to 28 weeks gestation. The ADA also thinks that inmates should get “diet education, multidisciplinary communication, and monitoring of food intake” in prison. They should have access to a Registered Dietician to provide diet instruction. They should be taught how to count carbohydrates and other components of diet in a group setting (in other words, they should receive the full provision of DSME or Diabetes Self-Management Education). Guidelines also get in to how medical emergencies should be handled, including hyperglycemia, and teaching guards how to recognize symptoms that require emergency treatment. Are you allowed to self-manage your diabetes in prison? It seems to depend on where you are incarcerated as to whether or not you receive good diabetes care in prison, and are allowed to self-manage your condition. There are many cases in the news of those who did not receive appropriate care, and were allowed to slip into a diabetic coma from ketoacidosis or whose blood sugars dipped so dangerously low that they had a seizure and died. In reading around forums on this subject, some people report fairly good treatment, and improved diabetes control from the structured environment. Others report inadequate care that results in frequent issues. One woman reports going blind while in prison due to lack of insulin and hyperglycemia over a long incarceration period. It’s true that to control a diabetics blood sugars and provide appropriate care for those imprisoned long-term, would save the prison system and tax payers in medical costs for treating diabetes complications. Better care requires less transportation of the prisoner out of the facility to a hospital, thus improving security. Lack of trained staff to provide appropriate diabetes care in our over-crowded prisons is one problem. Some prisons only employ LPN’s, who are not allowed to assess. Medical nutritional therapy from registered dieticians also has gone lacking in prisons, and the diet is loaded in carbohydrates and added sugars. Prisoners are routinely given Kool-Aid. Vegetables and fruits are scarce. Exercise is often withheld. Most prisons won’t allow a prisoner to keep insulin needles or blood glucose monitors in the cell with them. Therefore, they must leave the cell, and go see the nurse- who checks their blood sugar and administers their insulin, often at a maximum of twice daily. This is a big problem for Type 1 diabetics, as they often need 4 or more injections of insulin per day to get descent control. Type 1s who use a pump will have to say goodbye to it in prison. They won’t be allowed to have the pump with a needle inserted into their skin for prison safety purposes. I interviewed a Registered Nurse at a local county jail. It seems that when you come into this particular county jail, you had better be aware of your own symptoms of low blood sugar. It is also apparent from speaking with the nurse, that you should speak up when the guards make their 15 minute rounds, because a diabetic is on “diabetic restrictions” and will only be allowed to buy sugar free snacks to take back to the cell. They are allowed nothing in their cell with quick acting carbohydrates to bring up a low blood sugar. If they feel low blood sugar symptoms coming on, they are to inform an officer on duty. Those with hypoglycemia unawareness are at significant risk at this particular county jail with the current practice that is in place. They are not allowed insulin injections, nor self-monitoring of blood sugar. They are not allowed to have any type of needle that could be considered a weapon in their jail cell. Upon intake, if they say they are diabetic, they get processed through the nurse’s office right away, unless the inmate tells them they have had their medicine for the day. If they don’t speak up and say they are diabetic, the deadline for medical processing is 24 hours. It really depends on the situation, according to the jail nurse interviewed. They are only allowed to exercise in their jail cells with no equipment provided, but they do get a “diabetic diet.” The nurse interviewed for this anonymous report was unable to think of any “earth shattering” incidents while she has been working at the county jail where a patient got into serious medical trouble leading to an incident. So far, they have had none that she is aware of. Federal Prison Guidelines – Are they more in line with ADA Recommendations? 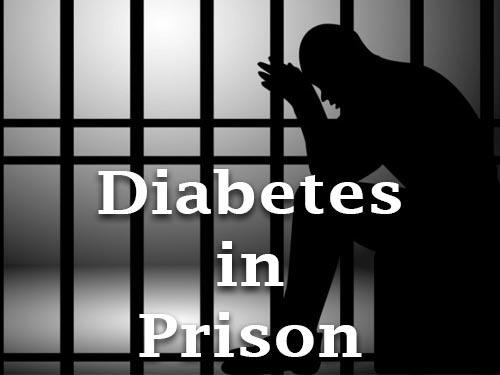 In some federal prison facilities, Type 1 and Type 2 diabetics who take insulin are all kept on the same cell block. This may be helpful, as other diabetic prisoners may pick up on the needs of other diabetic inmates in adjacent cells. It’s a fact that federal programs have the most guidelines. So goes it with the federal prison system. Still, internet searches yield a host of complaints related to diabetes care in the federal prison system. Again, care varies from institution to institution, and depends heavily on administration and their take on what kind and quality of care a diabetic patient may receive. It may also depend on the administration’s understanding of diabetes as a chronic disease, and even their knowledge of the different types and treatments for diabetes. It will depend on their policies and procedures in place, and their communication of the importance of following these policies and procedures from the top down. If they see that 4.8% of their population is getting foot ulcers that end up in amputation and a large financial expenditure for the institution, they may be more apt to put in place foot care for all diabetics in their facility. Solitary confinement or lockdown – what then? 23 hours in the hole, as they say, can really stress a diabetic out. Blood sugars are going to soar, and from all accounts found by this author, you are not going to get the medical attention nor respect that you are looking for in solitary confinement. You will likely be thrown in there, with nothing but the floor underneath your body. The headlines read, “Diabetic Dies in Jail after Police Refuse to give him Insulin.” This story made national news when a man in custody was allowed to go into DKA. He became “too weak to hold up his own head.” He was arrested for not paying his child support, and reportedly told officers that he needed his insulin, but they ignored his repeated requests. On autopsy, his blood sugar was up to 2,500 mg/dl. In New York, a drug dealer was arrested and thrown in Rikers Island Federal Prison. He was denied access to his insulin, and went into DKA, dying after 14 hours. In Virginia, a woman held at a facility there claims to have gone blind and has started a lawsuit. These and other headline stories exist all over the United States, where conditions in over-crowded mass-incarcerated prisons are resulting in sub-standard medical care for all prisoners, not just diabetics. The ADA wrote a 59-page document outlining the “Legal Rights of Prisoners and Detainees with Diabetes.” In this document, constitutional rights of prisoners are outlined, and deliberate indifference to serious medical needs are considered to be cruel and unusual punishment. In other words, you should do your time, but you have the right to receive appropriate medical care for your condition while you are incarcerated. You are protected under the 8th Amendment of the US Constitution, as are those that are in pre-conviction detention who are protected under the Fourteenth Amendment. Some court cases also site the American with Disabilities act as outlining rights for diabetics in prison3. If a prisoner feels that his constitutional rights have been violated, the ADA document gives steps to take when filing a claim where the defendant is a state, municipality or government official. The majority of claims relate to healthcare that is sub-par. You must prove this, and in one case, a nurse missed one injection for a type 2 diabetic, but it resulted in no immediate problems for the diabetic. Therefore, the plaintiff was not able to show that it was “cruel and unusual punishment,” or “deliberate indifference” that violated his rights. It was simply a medicine error, so the courts will look at the severity to determine if your rights have been violated. How can prisoners obtain legal advocacy? The ADA is the place to look for online resources in the area of advocacy for those who feel that their rights have been violated in prison due to lack of medical treatment, or inadequate medical attention. They also offer advocacy, and you can click here, to go to their advocacy page, where you can ask questions and get help with finding legal assistance. Another good page to read about your rights related to correctional facilities also provides a link to the Prisoner Diabetes Handbook, and other resources. It is also on the ADA website. Click here to go to the resource page. If I am in the county jail, will I get the same attention to my diabetes as I would get at a federal penitentiary? In the county jail, they tend to not stick by ADA recommendations as much as in the federal institutions. The federal prisons have more guidelines, more services and more funding to care for those with chronic diseases than do county jail facilities. How often are type 2 diabetics who don’t use insulin allowed to check their blood sugars in prison? From the research that I have done on county and federal prisons, a type 2 diabetic would not be allowed to check his own blood sugars in his cell in most cases. In some federal prisons, inmates report they are allowed to have a glucometer in their cell. In others federal penitentiaries, they are not allowed. This usually depends on the level of security of the federal prison. However, prisoners with type 2 diabetes in prison who do not take insulin generally visit the nurse for blood sugar checks and medication 1 to 2 times per day, depending on their doctor’s orders. 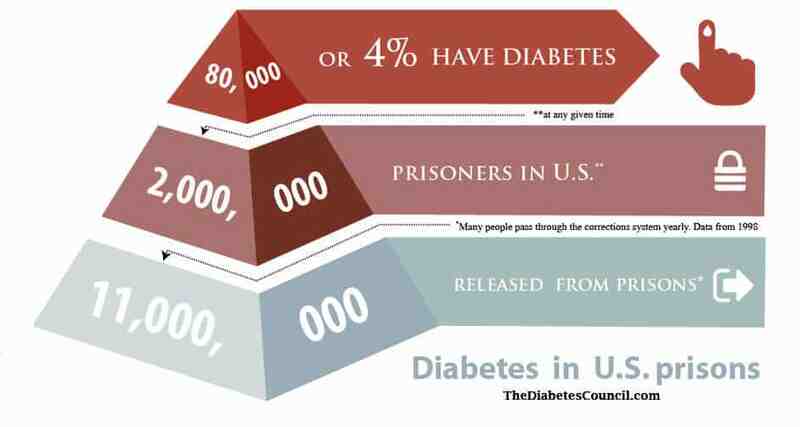 Are all diabetics treated the same across all prisons and jail systems in the United States? No, varying financial situations, budgets, availability of trained staff, and even warden opinions on care for diabetic patients in prison, can affect the level of care. Those prisons in urban areas may have access to better care and services, as well as trained staff. Rural areas may lack in medical personnel to promptly deal with situations diabetics encounter, and lack in funding for needed services. Do you get to keep a blood sugar machine in your cell in prison or jail? In the county jail perspective section above, one county jail nurse interviewed stated that the county inmates are not allowed to keep any kind of sharp or needle in their cells. In several blogs online, I was able to find where some federal prisons do allow diabetics to keep their glucometer in their cell and monitor their own blood sugars. This is not the case in all federal prisons. However, the ADA does recommend that patients in prison with diabetes should be allowed to self-monitor their blood glucose. Are prisoners allowed to have food in their cells to combat low blood sugar symptoms? The nurse interviewed in the county jail perspective above states that patients are under “diabetes restrictions,” and are therefore not allowed to have any carbohydrate containing food in their cells. All snacks purchased at the commissary are to be sugar (carbohydrate) free. They must notify the guard on their 15 minute rounds if they have signs of high or low blood sugars, and rely on the guard to report to the nurse. Those with hypoglycemia unawareness would be at risk. In the federal and possibly some county prisons, carbohydrates are allowed in the inmate’s cell, but this may vary from facility to facility, based on many factors. If prison or jail meals are vary starchy, are they allowed substitutions? In some larger facilities where there are dieticians, the diabetic may be given healthier substitutions, but for the most part, the internet is filled with inmates with diabetes complaining about poor dietary choices in prisons and jails nationwide. Do diabetics who are incarcerated get a different diet? If they are not allowed to keep a fast acting carbohydrate in their cell, are they able to get juice or something to bring up their blood sugar? In some cases, yes. Other high profile cases in the news criticize prison officials when inmates are allowed to have seizures and die in their cells due to no quick carbohydrates available and lack of timeliness of response by guards and prison medical personnel. If a diabetic prisoner experiences high blood sugar and diabetic ketoacidosis (extremely high blood sugar over 500 mg/dl) do they take inmates to the hospital or keep them in their cells? This has a lot to do with the prison officials and the guards on duty at the time of the medical emergency. You can refer to the section above, “Diabetic Prisoners in the News,” above, for stories that made national headlines related to this subject where a prisoner died due to DKA (Diabetic Ketoacidosis). Has anyone ever died in prison from diabetes acute complications? Can you wear an insulin pump in prison? No, it is considered a weapon. Insulin is given by the medical staff in prison. Will I be able to get diabetes education in prison? The ADA thinks you should, but whether or not this is the case, varies from facility to facility, and may be based on availability of qualified providers, administration support of the program, and funding, among other things. How can I manage my diabetes during periods of solitary confinement or lockdown? See the section on solitary confinement and lockdowns above. What are my rights and what if I’m unhappy with the care I receive for diabetes in prison? See the section above on legal rights and how to obtain advocacy. Are women with diabetes in prison getting different treatment than men? Research revealed poor treatment for diabetics for both men and women in correctional institutions in certain situations. However, I have seen no research to back up that care for one gender is better or worse than for another gender. What if I need specialized care in prison because of diabetes? Will I get it? Maybe, and maybe not. It depends on the facility. Some people complain that they only have plastic flip-flop style shoes in prison, and no appropriate footwear. Some complain that they are not allowed specialized treatments such as to go to a hyperbaric wound healing clinic. How will I be able to make an appointment with medical staff when I’m an inmate? In some instances, you may be able to send a message through a guard, or send a request through the prison warden. American Diabetes Association: Diabetes Management in Correctional Institutions. Vol. 37, Supplement 1, Jan, 2014. I dont know how their medical needs are met (or not). And whether the laws are enforced in a lot of the places that is questionable. From what I have heard (my nurse friend told me) the food serviced to inmates is awful. Besides meager portions, the meals are not well balanced–by any stretch. “Mystery meat” has been served often and many men have gotten sick from eating it. Sometimes the food is spoiled and many men get flu-like symptoms. Fruit is rarely provided and often it is old and beginning to rot. Only a few vegetables have ever been served–mostly they are given greens soaked in some kind of oil. Muslims can request a different variety of foods, which She thinks is healthier than what everyone else is given. Some men have thought to pretend they are Muslims so they could get better food, but there are strict rules and regulations requiring proof that you are of that faith.